For those of you who remember reading in Aural Innovations about Detroit rockers Walk On Water, Novadriver is a new band formed by 3/4 of that band... Billy Reedy on guitars and vocals, James B. Anders on bass and guitar, Eric Miller on drums and percussion, plus newcomer Mark Miers on organ and vocals. Imagine Walk On Water heading down a Monster Magnet path and you'll get something like Novadriver. The music is Stoner heavy in the Black Sabbath spirit and gorgeously acid psychedelic, but the boys haven't forsaken the good old rock 'n roll feel that Walk On Water had. The music moves along at a blazing head-boppin' clip, rather than the valium-paced sludge that characterizes so much Stoner rock. In fact, a great 70's heavy rock feel prevails throughout the album. After an instrumental intro the band launch hard and heavy into "Rocket Superstar", complete with screaming wah'd space licks and crunchy Stoner chords. "End Of The Universe", "Particle Explosion", and "Shoot The Sky" are easily my favorite tracks. "End Of The Universe" is an upbeat rocker with layers of swirling space guitars and chainsaw chords. I didn't really appreciate this tune until I listened with headphones. Then all the varied guitar layers and little voice samples revealed themselves, making this a killer track and showcasing some damn fine use of the studio. "Particle Explosion" is the other standout guitar track with some of the most blazing and tripped out bubbling guitars on the album. Imagine Black Sabbath switching from valium to speed. And "Shoot The Sky" just really grabbed me. It's a great song and rocks HARD! Love those bashing and screaming guitars. I almost blew the speakers in my car from playing this so loud. 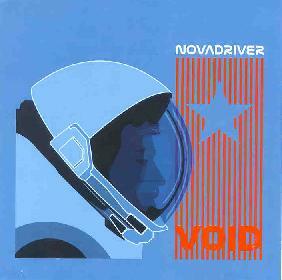 In summary, Novadriver are a damn fine psych rockin' good time. And they know how to write solid catchy songs as well. The playing is solid, good vocals, excellent production, and lots of cosmic heavy rock 'n roll. A lot of these songs have serious radio play potential, but don't let that scare you off. I don't think anyone on MTV is wailing on their guitars like these guys. Stoner psych fans that want more roll with their rock rather than just zoning out can step right this way. For more information you can visit the Novadriver web site at: http://www.novadriver.com. Void is distributed by Small Stone Records. You can visit their web site at: http://www.smallstone.com. Contact via snail mail c/o Small Stone Records; PO Box 02007; Detroit, MI 48202.